The Change Bitmap Layer Resolution dialog box lets you change the resolution of a bitmap layer to better suit the needs of your scene. For tasks related to this dialog box, see Setting the Resolution of Bitmap Layers. 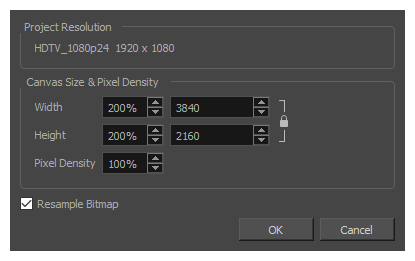 From the Layers panel or the Layers view, select the bitmap layer for which you want to change the resolution. Right-click the layer and select Change Bitmap Layer. From the top menu, select Layer > Change Bitmap Layer Resolution. When enabled, the artwork is resampled based on the new Pixel Density to preserve its currents proportions in the stage. Otherwise, increasing the pixel density will scale down the artwork, and decreasing it will scale it up.